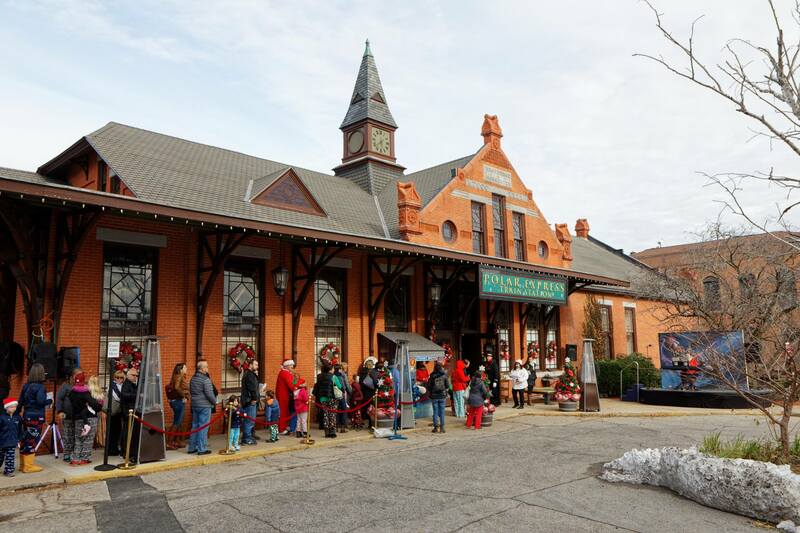 Make family memories on the Blackstone Valley Polar Express in Woonsocket or other train attractions in nearby towns. Getting ready to board the Blackstone Valley Polar Express train ride in Woonsocket, Rhode Island. 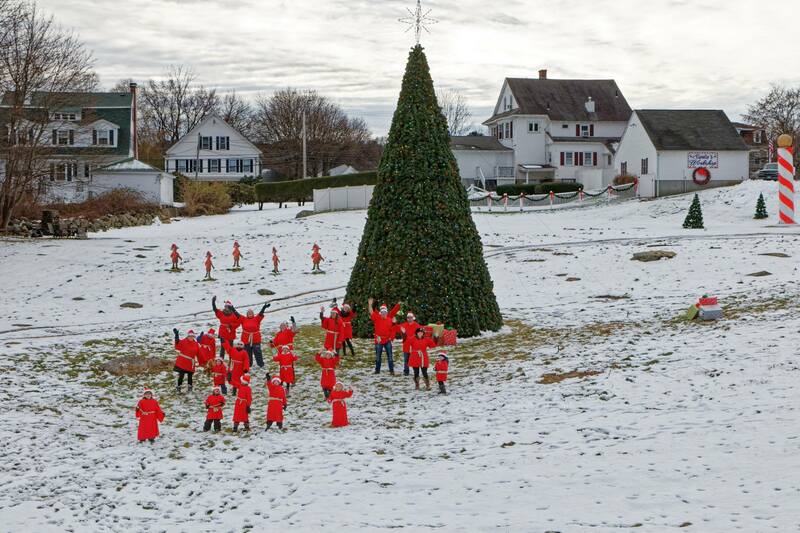 Photos by Bob Berard from the Blackstone Valley Polar Express Facebook page. Editor’s Note: This article was updated on Nov. 26., 2018 from an earlier version. The magic begins when confetti suddenly explodes inside the train station and snow begins to fall outside right before children board the Blackstone Valley Polar Express in Woonsocket. The conductor waves to happy families as train cars patiently await passengers at the historic Blackstone Valley Train Depot. The train cars have names like Dasher, Dancer and Prancer and Comet and Cupid and Rudolph. Children laugh and smile as they are greeted by peppy costumed characters who get them excited for an adventure to the North Pole. The Blackstone Valley Polar Express is a special local holiday attraction because the author of the book, Chris Van Allsburg, lived in Rhode Island. He wrote the book in 1985, and it’s been a treasured tradition for families all over the world ever since. Many of the families that ride the Blackstone Valley Polar Express are decked out in holiday pajamas. Some even wear matching pajamas as they head to their seats. Each child gets a song book filled with Christmas carols that also doubles as a coloring and activity book to keep them busy on the ninety-minute train ride. Everyone gets cozy in their seats as the train begins to depart and the reading of the Polar Express begins. The journey includes a reading of the book, sing-along songs, hot cocoa for each guest served in a take-home commemorative travel mug and cookies. Reading the Polar Express on the train. Halfway through the trip, the train pulls up to the real North Pole. Look out the window, and if you are lucky, and the snow cooperates, you might see Santa’s sleigh tracks leading up the hill. 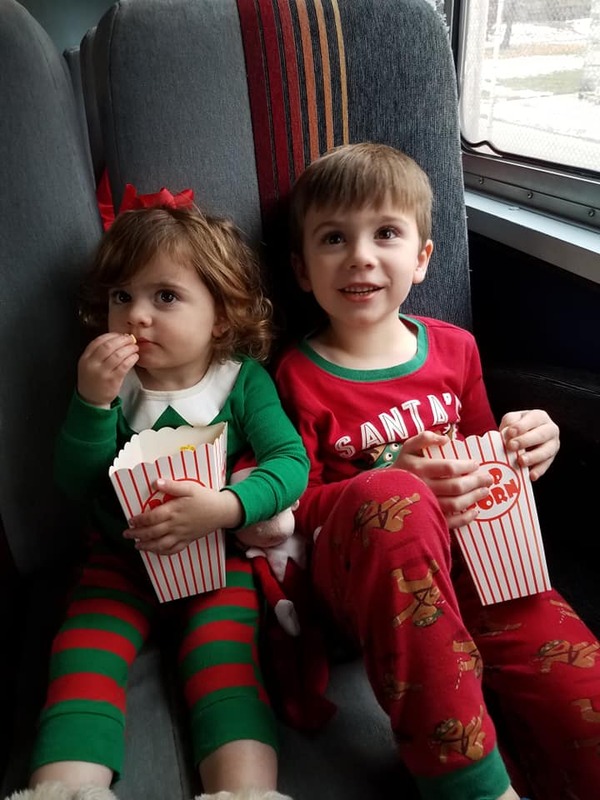 There will be a large group of elves dressed in red Santa hats that greets the train by a gigantic Christmas tree, waving and smiling and sharing their excitement with the kids on the train. When the train arrives at the North Pole, the children will also meet Santa, who will walk through each train car, present each child with a magical silver jingle bell and stop a moment to snap a photo. Greetings from the North Pole on the Blackstone Valley Polar Express. Soon the Christmas carols will be sung in each train car – if you don’t know the words, just peek inside the song books given to each child. The performers on each train have amazing singing voices, especially in the Dancer car, where I was a passenger. Jeff Gamache has such a great voice he could release his own Christmas album. The ride finishes with a few songs and games, maybe even some holiday bingo, where every kid miraculously wins a candy cane. The conductor will also make the rounds to punch everyone’s keepsake golden ticket. Finally, the music is turned up and the Polar Express finale is a dance party in the seats and aisles with kids jamming out to jingle bells. 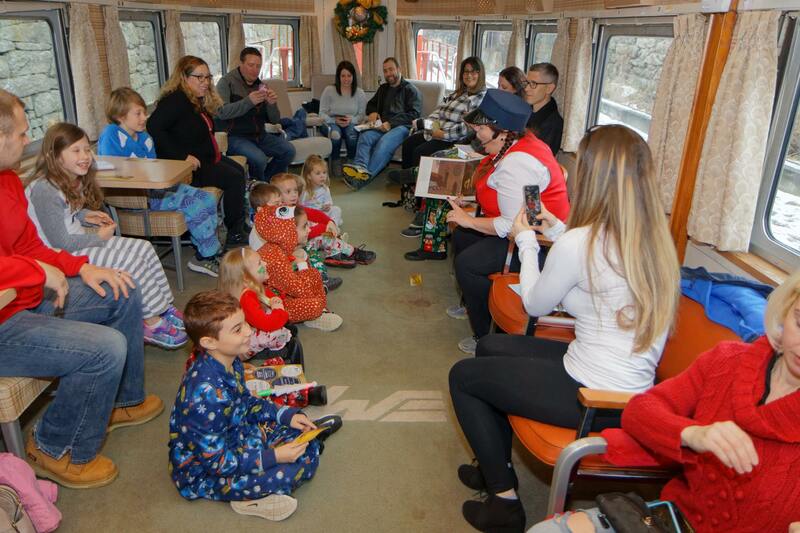 The Blackstone Valley Polar Express is a way to create a family memory that is as timeless as the book itself.